Over a year after House of M under whelmed comic readers, Christos Gage and Mike Perkins bring us this tale of that world before we joined the program already in progress. This is an odd project, mostly because absolutely no one demanded it. People hated House of M. Loathed it. Despised it. Hoped it’d get it’s arms caught in the gears of a combine. 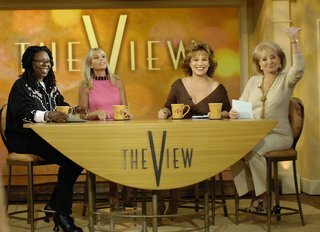 Wanted to force it to watch The View on a continuous loop for all eternity. So imagine my surprise when House of M: Avengers turned out to be actually decent. This story of urban, street level vigilantes fighting against the entrenched superpowered government works on a lot of levels. Even when it fails, it does so in such a way that I never held those failures against it. 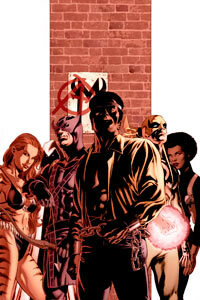 In the House of M world, mutants outnumber normal humans (called sapiens) by a significant margin. As a result, all of the hate heaped upon mutants in the regular Marvel Comics world has been turned back on the sapiens tenfold. Luke Cage doesn’t much care for this, so he recruits a gang of heroes to keep the Hell’s Kitchen part of New York free from oppression. It’s a story we’ve all seen before, but Gage adds enough twists and new spins that I was interested throughout. Now those failures I mentioned early are pretty glaring in light of the overall quality of the series. In this world, everyone hates sapiens. The sympathizers are so few and far between that it’s a bit ridiculous how much hate our band of good guys is subjected to. This extends to Thunderbird, the FBI agent in charge of catching/killing the group. I don’t remember being given a reason for his hatred, but apparently it’s so all-encompassing that he’s willing to make a deal with the Kingpin (himself the leader of criminal organization full of Marvel bad guys) that essentially cedes control of New York’s underworld to the fat man. The mini starts one place, with Luke Cage settling old scores, and then takes off into grander vistas. It’s a bit off-putting, really, to start with a revenge tale and end with a David vs. Goliath battle. It feels like Gage knew where he wanted to go with the story, but wasn’t sure where to start. This extends to the title, because I’m not sure how this books is really an Avengers story. Sure, Hawkeye, Moon Knight, and Tigra have been Avengers in the past and Luke Cage and Iron Fist are Avengers now, but other than that there’s no connection. The Avengers’ tagline reads “Earth’s Mightiest Heroes,” and that doesn’t apply here. On the positive side, Mike Perkins is a competent artist who never gets in his own way. Everything is clear and easy to follow, and his somewhat subdued style fits the tone of the book. These Avengers aren’t hugely powerful and not overly colorful, and Perkins makes sure we’re always aware of that. He’s a bit of a cross between Steve Epting and Mike McKone, two artist whose work I’ve enjoyed over the years. Like I said, I enjoyed this series despite its flaws. I’m not sure I would recommend it to anyone but diehard comics fans, though. You’d need to know your recent Marvel history and probably have a healthy affection for the characters featured in the story to get any enjoyment out of the book. Were this published two years ago, I can see it being a pretty big hit. Today, however, it’s a nice diversion that is ultimately fleeting. Tags: Christos Gage, comics, House of M: Avengers, Marvel comics, Mike Perkins, outdated ideas, Sweet Christmas! This entry was posted on July 8, 2008 at 1:00 pm and is filed under Uncategorized. You can follow any responses to this entry through the RSS 2.0 feed. You can leave a response, or trackback from your own site.